DC Rock Club: How does that go again? I admit to listening to No Doubt and Kelly Clarkson and one advantage is that I can actually understand what they are saying. I never get the words right, but it makes for great fun for those around me. I refuse to listen to No Doubt. Anything resembling ska music drives me crazy. Plus, I don't get why people think Gwen S. is so hot. Until she got pregnant, I was convinced gwen stefani was born sexually ambiguous, and her parents chose for her to be a girl. Here's another "ska" band you can add to the list JS. I asked for the No Doubt greatest hits CD 2 years ago for Christmas. Thanks Santa. I am not ashamed to admit it. I also think Gwen Stephanie is hot, although Kevin had a good theory working. Then again, I'm a sucker for mediocrity adorned by something pretty and shiny. Lucky for me, there's a lot of that out there. I'm not an American Idol fan, but does have something to offer in the comedy department. 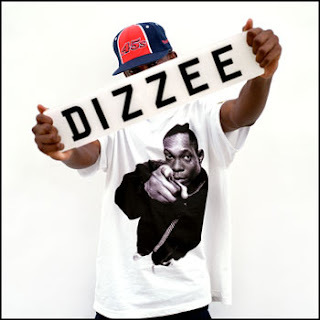 Does anybody know where I can buy the t-shirt Dizzee Rascal is wearing in this picture? Been searching for it for about a month with absolutely no luck!